Strength - 4. Single origin. Definitely decaf. 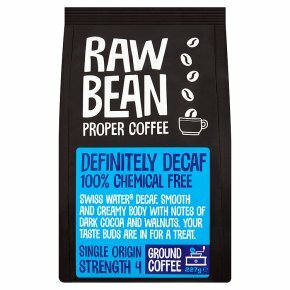 100% chemical free.Swiss water® decaf. Smooth and creamy body with notes of dark cocoa and walnuts. Your taste buds are in for a treat. Preparing the perfect cup You'll need one heaped dessert spoon of ground coffee per cup (if you'd prefer it stronger, add more). You can always add more water onced brewed if it's too strong. Allow the kettle to come off the boil to avoid scalding the coffee. Foe best results, add a few drops of water to wet the grounds before topping up, then leave to infuse for up to five minutes.